Most of the situations where WordPress sends an outgoing email can be classified as a notification. X just happened on your website and you should be aware of it. Back when WordPress was a youngster, the only way to reliably notify a user was via email. In 2016 we have many more options, including push notifications to mobile platforms, desktop notifications to browsers, messages to chat apps, endless services via webhooks, SMS messages, or even notifications in the WordPress admin area. The list goes on. For many users, email is no longer the optimal delivery mechanism for ephemeral notifications. To that end, let’s think about replacing wp_mail() with a modern API that allows developers to route notifications to services other than email, allow them to better modify notifications and the way in which they’re formatted, and allow them to do so without stepping on each others’ toes. Problem: Plugin A wants to provide HTML emails, and Plugin B wants to send emails via an email delivery service such as Mandrill. Plugin C wants to disregard emails and send Slack notifications. It’s very difficult for these to co-exist. There are only two types of destination for a notification in WordPress. Most notifications are actually notifications to a user account that get delivered via email because it’s the only contact information available for every user account. The remaining notifications are explicitly notifications to an email address rather than a user account (or not yet attached to a user account), such as when a user signs up for a blog and needs to click a confirmation link before their user account gets created. With this in mind, you might be able to imagine a notification class in WordPress core that defaults to delivering notifications via email, but which can be extended by a plugin on a per-user and per-notification basis to deliver notifications via any of the means listed above. WordPress core would support delivery via email and provide the API that allows plugins to implement delivery via other means. With a well-designed API, multiple plugins can co-exist in order to deliver different notifications via different mechanisms, format email notifications as HTML, easily disable notifications, change the delivery mechanism for email notifications, or provide a UI for users to manage their notification preferences and destinations. I’d like to begin work on a feature project with the intent of designing and implementing such an API. I’d like to get input from authors of existing plugins that provide functionality such as delivering notifications via a service other than email, that override the default email delivery mechanism, or that implement extra notifications (such as e-commerce sale notifications), in order that the API can be backwards compatible and that we can get some plugin implementations built during the API’s development. I already have some technical ideas regarding how the API might look, but I’m conscious that such an API needs to be well-designed before anyone jumps into writing code. Maybe we can even try some test-driven development? Who knows. In addition, consultation and involvement with the team that are working on the two-factor authentication feature project is important as it implements several delivery mechanisms for 2FA codes that could potentially be made simpler with a notifications API. Feedback is most welcome in the comments. Would you like to help out? Yes? Great. Let’s plan a date and time for a meeting in Slack and go from there. Finally, a reminder that feature projects are not tied to a specific release of WordPress. This won’t make 4.7. It would be great if it was mature enough for 4.8, but we won’t be aiming for a particular release just yet. Hey folks! I’m excited to announce the release of Beta 14 of the REST API. It’s been a while since our last release, beta 14 is jam packed with general improvements, bug fixes and general refinement to polish the feature plugin before core merge. Add support for password protected posts. There is now a protected attribute in the content and excerpt fields in post response. To view password protected posts via the API, use the password query parameter to provide the post’s password. Allow returning an error from field update callbacks. Simply have your update_callback return a WP_Error. Ability to order by slug, email and url on the users endpoints. Add sticky parameter to the posts endpoint. Update the wp-api.js client from the client-js repo. Thanks to all the contributors and special thanks to @chopinbach, @kadamwhite and @websupporter for their effort this release. We’ll be kicking Beta 15 which will be focused on meta support for posts, terms, comments and users as well as a brand new settings endpoint. These are currently in review awaiting feedback, check out the meta pull request and the settings pull request and let us know what you think. In addition we will be publishing a merge proposal for WordPress 4.7 this week, stay tuned! If you’ve used Slack or Thefacebook recently, you’ll have noticed a new way of interacting and providing feedback – emoji reactions. It works much the same way as a Like button, but provides a wider range of reactions, so readers can give more nuanced feedback, without needing to go to the effort of leaving a comment. This also allows for readers to provide the same level of interaction in situations where a “Like” is an inappropriate message to send, as Eric Meyer describes in his post about Inadvertent Algorithmic Cruelty. What is still being worked on? In its current state, the plugin is mostly a proof of concept, in need of significant work improving edge cases, design and User Experience. Your first step is to install the plugin, as well as the WP-API plugin (the WP-API plugin is currently a requirement to avoid code duplication, that will likely be re-evaluated based on when each plugin might be merged into Core). Please report any issues on the Github repository, or drop in the #feature-reactions channel in Slack to ask questions or give feedback. It’s also where we have our weekly chats, on Wednesday 23:00 UTC. Thank you! Happy Tuesday 🙂 The WP REST API team is proud to bring you: 2.0 Beta 12 “Canyonero”. Download it from the plugin repository or from GitHub. Removes meta endpoints from primary plugin. If your project depends on post meta endpoints, please install WP REST API Meta Endpoints. For the gory history of meta, read #1425 and linked issues. At this time, we recommend using register_rest_field() to expose meta (docs). Returns original resource when deleting PTCU. Now that all resources require the force param, we don’t need to wrap delete responses with the trash state. Uses roles rather than role in the Users controller. Building the REST API gives us the opportunity to standardize on roles, instead of having both roles and role. Moves to consistent use of context throughout controllers. Contexts limit the data present in the response. Here’s how to think of them: embed correlates with sidebar representation, view represents the primary public view, and edit is the data expected for an editor. Removes post_* query param support for GET /wp/v2/comments. The proper pattern is to use GET /wp/v2/posts to fetch the post IDs to limit the request to. Introduces rest_validate_request_arg()/rest_sanitize_request_arg(). Dedicated functions means we can use them for validating / sanitizing query args too. Removes WP_REST_Controller::validate_schema_property() and WP_REST_Controller::sanitize_schema_property(). As always, we have a detailed changelog as well as the full set of changes if you’re interested. Curious as to when the WP REST API endpoints will land in WordPress core? Me too! Existing Post, Term, User and Comment endpoints. New Site, Widgets, Menus, Plugins and Themes endpoints we started on Friday. REST API clients — those that exist, and those that don’t yet. With the stated goal of “Hiding the The Bleak Screen of Sadness”, the shiny updates team is working on bringing a smoother experience for managing plugins and themes to WordPress. Shiny Updates v2 is an effort to continue the shiny updates effort from WordPress 4.2. The original shiny update feature only includes shiny plugin updates. 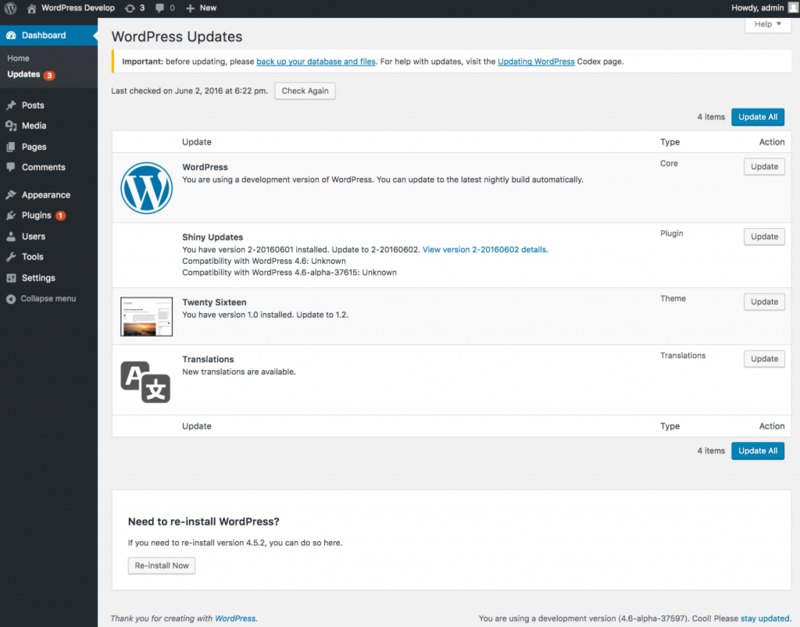 The new version aims to extend this to all aspects of updates, installs, and deletes for plugins, themes in WordPress. There are numerous screens in the Admin that allow you to install, update, and delete themes, plugins and WordPress itself. Shiny updates is exploring ways to improve their design and especially to offer a better user experience by improving perceived performance and limiting confusing notifications. Deleting single plugins, bulk updating and bulk deleting plugins from the plugin page. Shiny plugin installs from the plugin install screen: multiple actions can be queued up. Shiny theme installs, updates, and deletes, multiple queue-able, including multisite. Another round of user tests to get more feedback on the new flows. Anyone can help by testing the plugin! Download and install the plugin, then test out all the shiny features: try installing, updating, and deleting plug7ins and themes, including bulk actions, on both single and multisite. Does everything work as expected? Are there any jarring flows? Missing notifications? Please report any issues on the Github repository, or drop in the #feature-shinyupdates channel in Slack to ask questions or give feedback. It’s also where we have our weekly chats, on Tuesdays 19:00 UTC. Thank you! P.S. Props @adamsilverstein for ghost-writing this post.